Delta Faucet Company is committed to providing innovative technology and solutions that help people use water in better ways, both in the kitchen and bath. Consistent with this commitment, the company is focused on incorporating technology and design in a way that meets the discerning demands of a premium consumer. Market Delta products as one of the finest and most innovative brands in the plumbing and decorative hardware products industry. 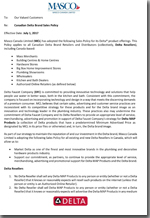 Support our commitment, with both our existing and future partners, to ensure we maintain and provide the appropriate level of service, merchandising, advertising and promotional support for Delta products and the Delta brand both now and in the future. Include a list of products that are subject to the MAP Policy. Click here to download a copy of the Product list. Will be reviewed by Masco Canada Limited annually to evaluate the inclusion or removal or MAP applicability to collections. Outline the consequences for violating our policies. 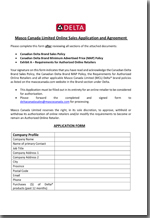 Outline requirements for becoming an Authorized Online Retailer. Click here to download a copy of the Authorized Online Reseller list. 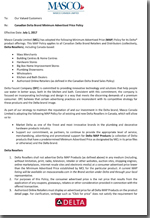 Please review the Delta Brand Sales Policy, Delta Brand MAP Policy and Authorized Online Retailer Application (links found below). The MAP Products will also be designated and communicated to our customers within a monthly price file. Thank you for your ongoing support of the Delta brand and our innovative products. If you have any questions, please contact your local Delta product sales representative.